So, What Type of Fishing Line Should You Use to Catch Crappie? Have you just read my article about crappie fishing tips? I’m sure you’re done. So, chances will you see that one of the most important things to have is choosing the right fishing line for crappie. A fishing line, just like other tools such as a fishing reel or fishing rod, it is critical to your success or failure of catching crappie. We all know that there are three main types of fishing line on the market nowadays. They are monofilament, braided, and fluorocarbon BUT, only two of them are suitable for crappie fishing and I will talk more details about that in this article. Also, I will take note some other critical features when it comes to considering the best fishing line for crappies, such as the size, the weight, or the strength. Now, without further ado, let’s get straight into it. Briefly, there are three main features to consider. They are weight, visibility, and types. Each of them has a close connection to the others, for example, the fishing line weight has an influence on its visibility, but the visibility is affected by the types. From that point, you should never forget these three factors when considering the right fishing line for crappie. The weight of the fishing line refers to the strength of the fishing line itself. And this factor is determined mainly by the technique that you want to use when you go for crappie fishing. If you are going to use stump bumping or jigging as your main crappie fishing technique, you need to use a heavy fishing line (meaning using a stronger line). The recommended fishing line is the one which has the 10 + test. This fishing line will be strong enough to pull the lures and baits back without encountering a snap. If you want to go jigging in open water or trolling, you can use a lighter fishing line. A light fishing line will have the weight ranging from 4 to 10 lbs. Another thing that you need to consider when you choose the weight of your fishing line is the visibility of the water where you go fishing for crappie. If you go fishing in the murky and unclear water, you can use a heavier line with the thicker diameter for crappie to detect the fishing line. On the other hand, in the clear water, you should go for a fishing line which is lighter. When a fishing line is lighter, the diameter of the line is small and it can reflect light better. As a result, the crappie will not be able to see the line and you can trick it into catching the lure. There are 2 factors that will impact the visibility of the fishing line. First is the type of the fishing line (as I mentioned above) and second is its diameter. The braided fishing line is more visible than the monofilament fishing line. And the monofilament fishing line is more visible than the fluorocarbon fishing line. Now, why should we consider how visible of the fishing line such carefully? Great question! Like the colors of fishing line, its visibility will affect directly on whether or not the fish can see it. However, I’m not asking you to opt for the most invisible line all the time when fishing crappie. They are freshwater species, though. They live in many places with different environments. And that difference will be influent on which type you should choose, too. An invisible line is a must when fishing in clear areas of water. BUT, in a murky and unclear area of water, a thicker, a more visible one is still acceptable. Why? When it comes to the diameter, there’s a basic rule of thumb. The thicker the fishing line is, the more visible it is to the fish. Keep in mind that you need to a tradeoff between the visibility of the fishing line and the strength of it. If you go for a very thin and nearly invisible fishing line, it means that you are taking a not so powerful fishing line. You would need to have a crappie fishing line with a high level of visibility. Crappie fishing is freshwater fishing and the body of fresh water is often clearer than the body of the saltwater. Therefore, a highly visible fishing line will help to trick the fish better. However, you need to also think about how easy it is for you to see the line as well. A fishing line which is nearly invisible to the fish might also difficult for you to detect a bite, especially in murky water areas. That’s why I advise you to opt for the MORE visible line when fishing in these places. A fishing line which is marked as “high-visibility” is my recommendation! You will be able to see this line clearly and know when a crappie takes a bite. However, make clear that I don’t ask you to choose the MOST visible line because it’s too highly visible to crappies, which are known for their keen eyes. As I told you above, three main fishing lines on the market now are monofilament, braided and fluorocarbon. However, as I have already pointed out the pros and cons of each type in the “Best Fishing Line Buying Guide Beginners Should Know” Article, here, I just mention about whether they are suitable for crappie fishing or not. This type of fishing line is translucent and as mentioned, it brings moderate visibility. So, in normal water condition, it will be impossible for fish to see. Besides, the monofilament is very affordable and widely available. However, it can become stretchy and lose its original shape. On the other hand, it has memory once you wrap the line around the fishing spool. So, Is It Suitable for Crappie Fishing? Being stretchy is one of the biggest weaknesses of monofilament fishing lines as when there is any fish biting the bait, you will difficultly notice it right away. However, stretchiness is a two-edged sword! Despite that disadvantage, it does actually make the line for suitable for fishing crappie. Crappie with their small and thin mouth will hook to the stretchy fishing line more easily. Another thing that you need to consider when using monofilament for fishing crappie is its relative weakness. A monofilament fishing line with the same diameter with other types of fishing line will have a lower strength. If you want to catch big fish, you will need to use a thicker monofilament fishing line. But, again, the thicker, the more visible to the fish. So, I only recommend using them in murky water. The braided line has a great strength even when the diameter is small. You can also have a great length of the fishing line spooled into the fishing reel. It is not stretchy like the monofilament fishing line. In term of visibility, this type of fishing line is not as good as the other fishing line. Is It Suitable for Crappie Fishing? While the braided line is not stretchy, which is a good thing in many cases; it is not suitable for fishing crappie. The hook might be ripped with a sturdy line like the braided line. In addition, since the braided line has the lowest level of visibility, it is not really a good choice for you to use when you go freshwater fishing such as crappie fishing. This type of fishing line is the most translucent type of fishing line to the extent that it is almost invisible. In addition, it is less stretchy than the monofilament fishing line and has less memory. But, this type of fishing line can continue to come off from the fishing reel even after you cast the bait. This problem is clearer with a heavy one. When crappie bites on the fluorocarbon fishing line, thanks to the sturdy construction of the line, it is very easy for you to notice. In addition, the fluorocarbon fishing line is very strong with a great ratio of strength to diameter. With a fluorocarbon fishing line, you can catch a trophy crappie fish. A fluorocarbon line is also suitable for fishing crappie, especially when you go ice fishing. It is highly resistant to harmful external factors, making it a worthy investment for crappie fishing in the long run. 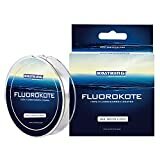 After considering all of the pros and cons of the 3 most common types of fishing line, I recommend you to go for the monofilament and the fluorocarbon. Particularly, the monofilament for spring crappie fishing and the fluorocarbon in the winter. Braided fishing line, well…they are not suitable for crappie fishing based on their too highly visible outlook. After considering such three big elements and also based on real experience, here, I proudly introduce to you my top 6 regular-used lines for crappie fishing. First of all is the Stren! If you are a fishing die-hard fan, chances might you know that Stren is one of the most popular US brands which produces monofilament and fluorocarbon fishing lines. One of the most significant features of a fishing line produced by Stren is that it is small but powerful. And, this monofilament fishing line for crappie is of no exception. I told it before that the monofilament is quite weak. However, this one is moderately strong and abrasion resistant. The strength of this line ranges from 2 to 10 pounds while it is available in 200-yard length option. Besides, there are 2 colors for you to choose from which are clear and gold. Now, when to use this fishing line? Stren Crappie Monofilament Fishing Line is the best use when you want to attach small jigs to catch normally sized crappies. The areas of water which is full of submerged trees and vegetation is also a great place for you to try this type of line. However, it is not suitable for the murky area of water. You shouldn’t use it when it is dark outside as well. Crappie will not be able to detect the lure and bite on them in these cases. This fishing line has the pound test of 4 by Wally Marshall, the diameter of 0.0008 inches and the yard is 2000. Perfect for crappie casting on 1/32 jigs. It is the monofilament fishing line which is made of high-quality materials to be highly resistant to corrosion. The best thing is that it has a high visibility yet low memory so, with the common annoyance of unwrapping them from the fishing spool, just kiss it goodbye. My tip to make the line even lower memory is either hooking or tying it to something and walk off as much line I can. Stretch the line good and tight, and then reel it back on my spinning reel. That truly makes a significant difference, guys! To sum up, for those who want to have a small reel usage or want to go fishing in deep water, this option is the best for you. On the contrary, it is a “nah” from me with big and heavy lures and baits. As a result, this fishing line is not suitable if you aim for trophy fish to catch with. Kastking is another good brand that’s worth considering! I got the first chance trying it over the weekend a year ago and from that on, have stuck to it. Work pretty great on 1/32 jig heads and 6’6 light action rod for crappie fishing. Featured as the superior mono nylon material, (which is also perfect for bass fishing, by the way), the colors added help a lot for its super invisible look to help you notice fish better. Basically, there are 5 options including yellow, red, green, blue, and transparent. In addition, choose from 2 options of length which are 300 yards and 600 yards. It’s thin, though. The Kastking line is still strong enough, ranging from 12 to 30 lbs. to get ready for any big fish. One of the most significant features of this fishing line is that it is made with the Parallel Roll Tracking technology, which means it comes in low memory for you to easily handle and cast the bait. Even on a windy day, this Kastking’s casts like a dream. It performed on the water really better than what I expected – flat landed, no curls, no kinks. This’s totally different from the Berkely Sensation or other line kinds on the market. Compared to my previous fishing line for crappie which is Suffix Siege 6lb mono, this is much better than. The Kastking, it comes in thinner yet much stronger performance, the casting is smoother whilst the feeling of the bite is more sensitive. Another good thing is its striking low absorption for quicker retrieval and less limpness to keep you ease in mind. 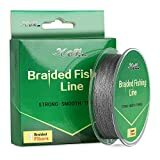 As a result, this fishing line is suitable for you when you use mostly all kinds of techniques for fishing crappies. Particularly, it is also suitable for both saltwater fishing and freshwater fishing. For regular water or a little bit murky area, this is my high recommendation. The more you use it, the more you ask yourself why you didn’t buy it earlier. 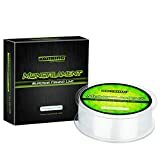 While the Premium Mono above is quite strong with a thin diameter, if you want extra visibility in case the area where you go fishing is very clear, seek for some other types of fishing lines, preferably the fluorocarbon. And my pick for this is, again, the Kastking’s. It proudly won the ICAST 2015 Award-winning brand. In fact, this is a perfect combination of the high-tech fluorocarbon coating and the No.1 selling KastKing Copolymer Fishing Line to deliver a low visible performance, low memory and striking high cast-ability. But, an advance in this FluoroKote is that it’s smaller than the Copolymer yet a lot stronger. Plus, it comes in low absorption to soak faster in water. From that point, this is a great choice for those who intend to fish in deeper waters, like using diving baits. Besides, it does bring high reel capacity as well. With this product, you will receive more benefits than challenges with low stretch, great abrasion resistance, moderate visibility, good strength and higher density. It’s not stretchy, which gives very sensitive feeling if any fish eat the baits so, just feel ease in mind to fish no matter which techniques you use or water condition you are fishing in. Easy peasy! In other words, compared to other fluorocarbon kinds on the market in the same price range, this is the best of the best. If you don’t want to buy tools and equipment for crappie fishing separately, you can have a look at this toolbox. It contains a straight line 101, some ultra-light jigs, a combo of two rods for crappie fishing and panfish, a 24-inch light action bobber, a blank through construction, a custom reel seat with cork, and a nice rod case. No lures, but in turns, you will get a small tackle box with four compartments. And, another good news is you will get both poles, which is great value for money. Besides, the pre-installed pound test is rated roughly from 1 to 4 lb. and I think it’s up to 4 lb. test on the spool. With all of the tools that you would need to use when you go fishing for crappie, this versatile tool can be used in all of the situations. You can use it in 4 seasons throughout the year, especially in winter. Also, highly recommend this when you go fishing in both deep and shallow areas of water. More importantly, it’s perfect for ice fishing. Okay, I know that you might get confused now based on what I’ve told you before – braided line is not recommended for crappie fishing. So, why this bad boy is here? This braided fishing line is made with the New Technology – which is the Parallel weaving craft-line for the best shape and smoothness of the line. Other features of this fishing line BUT must consider is its zero stretch, ultra-high sensitivity, and low memory. No wind knot at all! 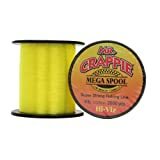 More importantly, it is the best fishing line for crappie which is braided on the market with the strength ranging from 15 to 30 lbs. The length of the line is 300 yards. To be honest, the reason made me pick this one home to try is its great warranty. HOFAM offers a 100% satisfaction guarantee that if you don’t find their product satisfied your need, just return it for no excuse and get a full refund. So, my thought was kind of “Why not?” and I’m glad that I haven’t returned it yet. One more highlight is its color – grey. This is a useful feature for anglers because it’s visible enough for us to see what’s happening down there YET the fish won’t notice it easily, even you cast in different waters. It’s tough, though. Even you use sewing scissors, it’s quite hard to cut through. However, with amateur anglers, this might not be a pro because it asks more techniques to use efficiently. In other words, this is truly an exception that bangs for your buck, especially when you go ice fishing for crappie. As you can see, choosing the best fishing line for crappies is never an easy task at all. There are 3 types of fishing line on the market for you to choose from with different choices of colors and strength. But, I recommend you go with a monofilament fishing line or a fluorocarbon fishing line instead of a braided line. In addition, you need to take into account the size of the crappies you want to catch and the condition of your fishing area. I hope that with all of the information above, you would be able to find the best fishing lines for crappie and have many enjoyable fishing trips in the future.